When I first moved to Crown Heights in 2013, the neighborhood was “up and coming.” Many of the eateries and boutiques you now find on Franklin Avenue hadn’t opened yet but the neighborhood and its gentrification was making news; a few good coffee shops were thriving but Starbucks wasn’t here yet. I was only a half mile from Prospect Park where I intended to run a lot. I knew a few friends nearby with whom I could go running with intermittently but it wasn’t enough. I wanted to explore more of Crown Heights and Brooklyn more than once a week; I wanted to stop feeling so alone at races in Central Park; I wanted to run with a group for motivation and safety; and I needed to find others who were (almost) as obsessed about running as I was. I looked up PPTC (Prospect Park Track Club) and NBR (North Brooklyn Runners) but meeting up with them from where I lived seemed too ambitious and I was intimidated by their club size and speed. 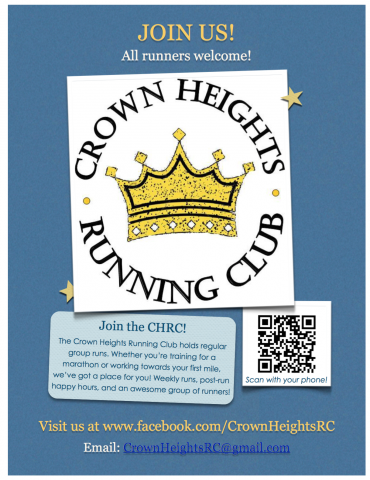 I found out on the NYRR website that there was indeed a Crown Heights Running Club. I hadn’t seen them at any races but I reached out by email. It was a couple months later when I excitedly received a response from Acacia, one of OGs of CHRC. She added me to the Google Group. I was in! At the time, the group consisted of a handful of runners who got out running together sporadically. 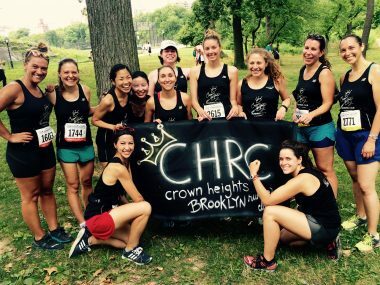 CHRC was founded 2012 by three women who lived in the same building, Adeline, Acacia and Anna with a clever concept of Running Royalty for Crown Heights. They were self-proclaimed “running rookies,” learning how to become runners and looking to run with each other for safety in the neighborhood. They put up flyers and set up a Facebook Page, attracting a small group of good people who were supportive, fun and committed to running and hanging out locally. I attempted to make some personal connections and finally met Stephanie and Peter. I remember the thrill I felt when I got home after my first run with her, feeling pumped about just having met someone new in my neighborhood while doing something I loved. I continued to train mostly on my own while actively announcing all my planned runs on the Google Group to see if anyone would join me. In 2014 after my first Brooklyn Half, Acacia announced she was moving to Harlem and asked for a leader to take over and continue “keeping the running and camaraderie alive!” Shortly thereafter, Adeline who was managing the administrative side (emails, Facebook Group etc.) also shared she was moving away. This group I mostly only knew via a message board was fast dissolving. I still desired to have a running community but I wasn’t sure I would be able to commit to leading it. I had a busy job with an irregular schedule and worried if I could ever host weekly runs on my own. In my continued search for a running group, I, and a couple of friends ran over to JackRabbit in Park Slope on a Saturday morning for a free group run. As it turned out, the leader didn’t show and the run was canceled. We three and one other runner had made it there so we decided to go on a run together. The other runner was also there in search of some people to run with regularly. If I recall correctly, I think we may have gone on a long sweaty run around Red Hook and back that morning and she stuck with us, talking and making us laugh all the way. Her enthusiasm and friendliness was astounding on a weekend morning! I was clear she and I shared the same need for people to run with. Coincidentally, she had also run over from her new home in Crown Heights! My mind started ticking… I felt intuitively that with her extroversion and my vision, we could jointly re-launch CHRC successfully. I told her about CHRC and tentatively asked whether she would consider assisting in the re-launch of the group. Her name is Danielle. She was not only my perfect partner in leading CHRC, but a dear friend for life. I met up with Danielle and Sarah (a member from the original Google Group who moved to California a few months later) at Breukelen Coffee House to re-launch CHRC; we wanted to take advantage of the summer running season so we got to work quickly. We committed to a three runs per week, and a monthly Meet’n Greet at a local establishment. We set up a website, posted a calendar, attended NYRR Club council meetings, sent out monthly updates via email and became more active on the Facebook Page. We conducted surveys to figure out when people wanted to run and asked where in the neighborhood they were coming from. We had our first generation logo designed and printed by Stephanie and nervously sported it at races on new singlets. In those early days, recruitment was hard. We had a few flyers up but we relied a lot on social media. We showed up, waited on street corners for several minutes, eagerly looking for members to join us. We each had our own way of managing these awkward waits. Sarah was methodical, leaving after waiting five minutes to complete her scheduled training run as planned. Danielle talked to any runner who passed her and by the time they went on, she had made a new friend and informed them about the next run. I was usually anxious, eagerly searching the faces of passersby, trying to play it off cool by stretching and retying my laces, eventually resigning to the fact I would be running alone again that day. It was definitely challenging to remain tenacious during this time. There were early mornings, when conditions weren’t the greatest but I promised I would be out there, so I was, with equal hope and doubt. We were lucky to have each other to manage these feelings and continue forth when the doubt overwhelmed the hope. Despite the low turnouts, we knew the interest for a community run club in Crown Heights was there. Our online presence was expanding and we were getting plenty of emails and messages expressing interest. When we did have runners, we tried to explore and help runners to see and learn about the neighborhood just by running through it. While the “group” runs were small, we were getting to know our area and letting people know about us too. The first summer and fall seasons ended with Danielle and I volunteering at, and being completely enamored by the NYC Marathon and our first Winter “Run”derland Holiday Party at my place. It was a small gathering: just a handful of enthusiastic early members, sharing food, holiday cheer and excitement about running. Over the course of the winter and early spring 2015, we started to see some regular committed runners, many who were in training for the Brooklyn Half Marathon in May. We sent out another survey to get feedback, and tried new things like earlier morning runs, later evening runs, evening bike rides, strength work, track workouts, trail runs. By the Team Championships that summer, one year after we had our CHRC re-boot, we had made the scoreboard at NYRR with a women’s team, (i.e. 5 female finishers at club points races) and had a small group of committed women leading the club’s runs and activities. With more leaders, we were able to really expand the breadth of our activities, connecting with each other and with the community at large, including volunteering with Girls On the Run – an organization we continue to have a special relationship with. We became more than running buddies; personal connection and friendship was primary. Our love for CHRC always started there. We soon started to see some men show up to our runs and I made it a goal in 2016 to have a men’s team on the NYRR scoreboard as well. We expanded the leadership to include a dozen members who formed the “Royal Council.” This council penned the mission statement of the club and established the spirit of CHRC which carries through in all its activities. It was an incredible feeling to bring together so many people who contributed their time or talent to making CHRC a great community of runners, neighbors and friends. In early 2016, Danielle shared she would be moving to Chicago. This was upsetting news for all of us. Danielle brought an energy that was unparalleled in its infectious loving kindness. In support of her last running wishes of NYC, we organized a personalized “Madhattan” Run, a 33mile around the perimeter of Manhattan – her longest run to-date. It was an incredible achievement for her but it also signified the birth of the running bananas aka #NegativeSplits (Dave ran 18miles with Danielle in a banana suit) and the first fully organized event by the Royal Council in which numerous members participated between Danielle’s first and last miles. In this run, she provided the opportunity for CHRC to embrace its enduring spirit of being organized, inclusive, resourceful and fun! Over the next year, CHRC and the Council’s activities continued to make strides as a club. I have been privileged to witness literal dreams come true as members completed their first half marathons, marathons, start coaching, finish trail races. In my life of running, there have been moments to push and miles to “ride.” So in 2017, I decided it was time for me to step back and see where running would take me next. I passed the scepter to the current Royal Council, allowing me to focus on the things that I enjoyed most about running and the club: leading the Stamina Run and see runners discover their own strength, run trails where my first love in running originated (middle school cross country), and I run races to see how far I can push my body’s limits. CHRC also realized my dreams: gifting me with my first (and only) Garmin for my birthday, to awarding me a trophy with my name on it, to finding a community of like-minded people in the sea of New Yorkers, giving me a sense of home in Crown Heights. CHRC now has 200 active members, 350+ on the Facebook Group, Social Media presence, 34 who ran the NYC Marathon last year, 66 ran the recent Brooklyn Half. 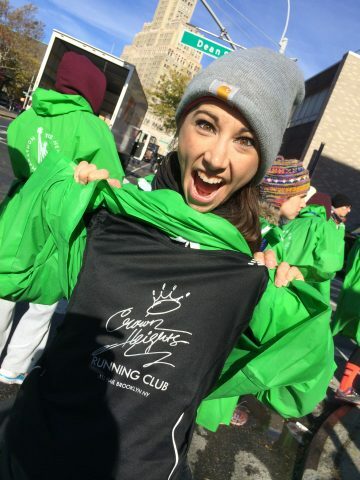 Members have run races in Chicago, Berlin, Tokyo, all while wearing the CHRC singlet. There are 5-6 varied runs weekly, scheduled trips and activities, volunteer groups, its very own “Chase the Banana” race, huge holiday parties and memorable Post-Marathon potlucks. The club is very busy with activities; however, at its core is simply neighbors and running. 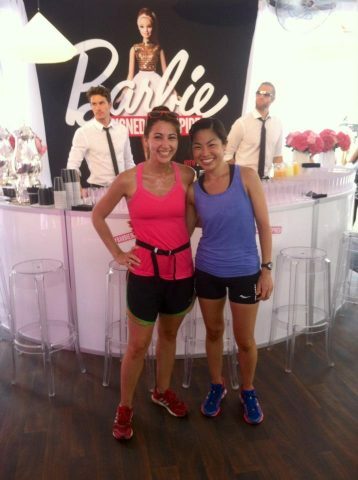 My favorite is still to come to a run, meet someone new and ask how they found the club and how they became runners. The above is one version of CHRC, but I think the Story of CHRC is best known by piecing together the narratives of each of us.